D and A guitar stands: We've all needed guitar stands to put our precious (and sometimes expensive) guitars on to. But how great are these D and A stands? will they damage the guitar? or fall over anytime soon? Find out now. Guitar stands... you might not think at first that an in depth review of guitar stands could be interesting and indeed educational. After all guitar stands are boring right? Well not really. You see, those stands are exceptionally critical in many ways (as I have found out myself over the years) such as... will the guitar get marked on its finish? Will the guitar easily fall over in the heat of a gig environment? Is it suitable to 'show' my guitar on the house or indeed commercial environments like the Hard Rock? And of course that list goes on and on - I'm sure you can think of even more reasons why the humble guitar stand MATTERS to you! Personally, I have had problems with inferior guitar stands for much of my playing life (and I'm now at 60! so you could say that I have some experience to base my opinions on. 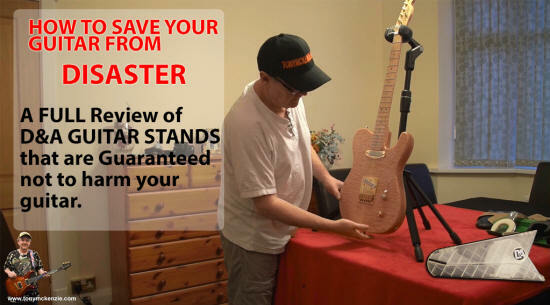 So below is the review of the D&A guitar stands from an American company... distributed in the UK by Rosetti. I don't get many items to review that I have not bought - one of the reasons why many guys trust my opinions... but I will confirm before we start that D&A (via Rosetti) lid send this gear for review. Trust me on this - it makes no difference... if the gear is not good I ALWAYS say so. In any case D and A sent 6 items for review - two wall hangers, a 'fold out' electric guitar floor stand and a similar acoustic guitar stand, and two 'starfish' metal stands. I'll take a look at these individually here in this review and remember there's a full video at the end of this review too. Well this stand on the face of it might not look much... but taking a closer look at it there's far more involved than what you see. Both the 'electric' version and the 'acoustic' version of the icestand are similar except that in the case of the acoustic stand, where the guitar rests its a fair amount wider to handle those larger acoustic guitar bodies. But for this review, we'll lump the two together for now (a more detailed 'view' is available on the video at the end of this short review). The Icestand is a very compact guitar stand and bearing in mind the weight it might have to carry (my shoulder hurts) it is surprisingly light too. The unit simply 'scissors' apart then opens two sides that are held in position with a bar that 'clicks ' in to place. Once you have done that the stand is ready to go - it's really that easy. This review is being updated presently so please check the news page regularly for updates.